It has been a very busy week around here! Well, make that a very busy summer and fall, now that I think about it. We’ve had so many visitors and guests – two big family birthday dinners, five of my book club friends from North Carolina, the annual reunion with my best friend’s whole family and mine too, my brother and nephew here from San Diego, more friends from North Carolina, and two months of weekly reunion committee dinner meetings -- that we wore out the front door. Seriously! The good news … we have chosen a beautiful new door to graciously welcome all who enter here. The bad news … it takes several weeks for the door of my dreams to be delivered. Of course! Until it arrives, we have installed a temporary front door. I know it sounds crazy, but what were we going do? More house guests arrive next week and then Thanksgiving is our big blended family holiday and we’re all booked up for that long weekend too. A boarded up front door just doesn’t say “welcome, we’re so happy to see you” like one that actually opens to let you inside. A gobblers gaggle of turkey goodies! As soon as the door was back in working order, my thoughts immediately turned to planning Thanksgiving. After five years of gathering all of our siblings, nieces, nephews, my parents, new in-laws and assorted friends, we have a rather large blended family gathered around our table every year. I have tried to make sure that everyone has a favorite holiday tradition represented at our huge buffet feast. For us that means at least four different cranberry dishes, three savory dressings, two big turkeys – and a partridge in a pair tree. Well, let’s just say that we are blessed with an abundance of savory and sweet dishes and there is simply no need to find one more cranberry recipe or another never-fail method for roasting the juiciest turkey ever. Enough already! So this year, Thanksgiving is for the kids! No cooking required – no recipes necessary! With a quick trip to the cookie and candy aisle at my local grocery and a dash to the fabric store, I was able to find everything I needed for all of the projects you see here. Most of these were inspired from the holiday craft section of the Disney Family Fun website. I’ve rewritten the instructions here to reflect my own versions shown in the pictures. The cantaloupe turkey obviously requires some knife work, so is best done with close adult supervision. Everyone can enjoy stuffing the turkey with feather skewers and then snacking on them while waiting for the main meal event. 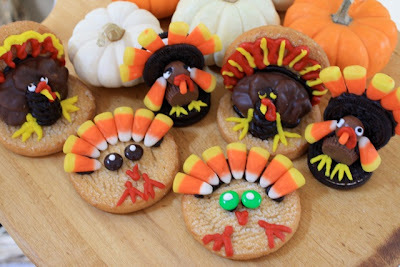 Most of the cookie turkey projects are easy enough for kids to assemble, with maybe just a little help with cutting and piping the icing – another good project for the family to enjoy. And what cute favors or place card holders they make! Just don’t be surprised if the little turkeys are missing some of the yummy parts before dinner is served! They are simply irresistible! The chair covers require a little more cutting, sewing two straight seams and some careful gluing. I made two covers in just about three hours – from drawing the pattern to clean up. It was an easy project for an experienced crafter, but set up an assembly line with crafters of varying skill levels and watch those feathers fly. What a cute idea for anyone exiled to the kids table for dinner. Or maybe one to honor the turkey carver in your family. Or even one for everyone at your Thanksgiving table. Yikes! I’d better get busy! Happy cooking! Happy crafting! Happy Thanksgiving! Wash and dry the cantaloupe, peppers and grapes. Cut a small slice on the bottom of the cantaloupe. Place the cut side down on a serving plate or tray. Wash the peppers and grapes. Cut each of the peppers into the turkey parts and cut the remaining pieces to use for the skewers. 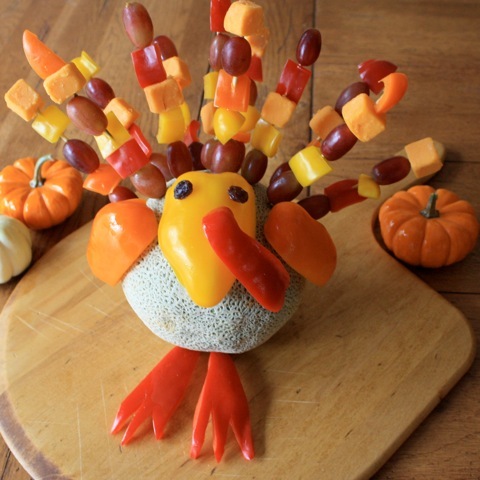 Secure each of the turkey parts to the cantaloupe with toothpicks or skewers. Use raisins secured with toothpicks for eyes. Thread red grapes, cheese cubes and pepper pieces onto skewers. Cover and refrigerate skewers and assembled turkey body separately until ready to serve. Place fruit, pepper and cheese skewers around back of cantaloupe for feathers just before serving. *Note: choose tidbits of food for skewers based on what your guests would like - grapes, cheese, marshmallows, cantaloupe, celery, grape tomatoes, apples, cantaloupe, pineapple, etc. Remember that some cut fruits may need to be dipped in a lemon juice and water mixture to prevent browning. Place card holders or yummy treats? Gently pull apart one Oreo – do not break! Place some of the White Icing into a Ziploc bag Spread a generous amount of White Icing on one side of the cookie and replace second side. Carefully press the tips of 6 pieces of candy corn into the icing between the cookies. Place a large amount of the Chocolate Icing in the Ziploc sandwich bag; squeeze the icing into one corner of the bag and cut off the corner of the bag. Squeeze some of the chocolate icing on top of a second Oreo, near the edge. 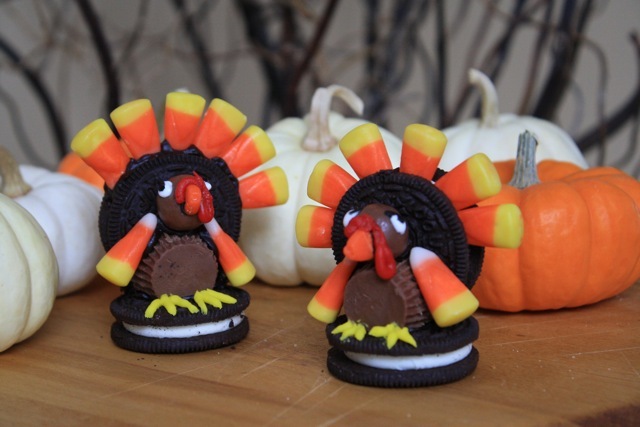 Stand the Oreo with Candy Corn on top of the icing on the second cookie and hold firmly – use more icing if it won’t stand up on its own. Cut a small slice from one side of the Peanut Butter Cup; squeeze some chocolate icing on the top side and the place it cut side down against the standing Oreo to form the body. Squeeze some chocolate icing onto the Whopper and place it on top of the Peanut Butter Cup to make the head. Place one piece of Candy Corn on each side of the body for the wings, using a bit of icing to secure. Cut the tip of one piece of Candy Corn, squeeze icing onto the flat side and place it on the face for a beak. Use the Decorating Icing tubes to pipe on two white eyes with black decorating gel dots in the center. Use the red icing to pipe a snood over the Candy Corn beak. Use the yellow icing to pipe two feet at the base of the body on top of the Oreo. Use toothpicks to shape icing, if necessary. Allow turkeys to dry for and hour or so before moving. 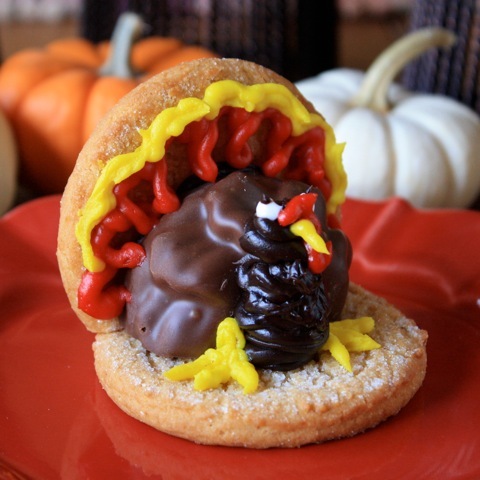 Double-Stuffed Turkeys can be used for place card holders or decorative and edible favors at each place at the table. Place some Chocolate Icing in the sandwich bag and cut one corner of the bag for a tip. Squeeze some icing on top of the cookie around the edge. Place about 7 pieces into the icing to form feathers. Choose two matching M&M’s for eyes and attach them to the cookie with icing and pipe two black dots in the center of each M&M – or use chocolate chips. Pipe the beak beneath the eyes and the feet at the bottom of the cookie with your choice of yellow, orange or red icing. Allow cookies to dry for about an hour for the icing to set. Save a turkey - eat more ham! Cut off about ½-inch piece from one side of a sugar cookie. Place some of the chocolate icing into the Ziploc bag and cut the corner. Pipe some chocolate to the trimmed cookie and stand it up on the edge of a second sugar cookie. Next, cut one Mallomar cookie in half with a sharp knife. Pipe some icing on the cut side and back of the Mallomar and place it against the front of the top cookie. Using a generous amount of chocolate icing, squeeze a mound of icing in front of the Mallomar body to form the head. Allow the icing to dry a bit before continuing. Place cookie on its back and pipe the outline of feathers on the sugar cookie above the body with red and/or yellow icing. With yellow icing, pipe a small beak on face and yellow feet on either side of the head. Using the white icing, pipe two eyes above the beak and then dot the center with black gel. Finally, pipe red icing over the top of the beak and down one side to form the snood. Oh goodie! I get to sit at the kid table! The Disney Family Fun website has templates to print out for the Turkey Chair Cover pattern, if you don’t want to draw your own. Print out the pattern to determine how much colored felt you need, based on the measurements for your chairs. First, decide how many chairs you want to cover and measure them for size before calculating how much white felt will be needed. Determine how far down the chair you want the cover to hang – to the arms, or to the seat for chairs without arms. Measure up, over and down to determine the length of the chair back. Next, measure all the way around the chair back at its widest point to get the total for the width and depth of the back, then add 1 inch for the seams – ½-inch on each side. After you cut the first chair cover, drape it over the chair with the wrong side out, and pin the sides to be sure it fits. 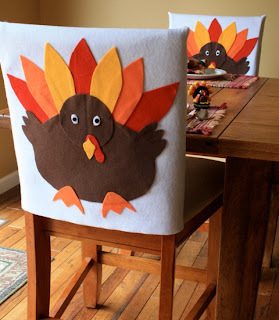 Make adjustments before cutting any additional chair covers. Sew the ½-inch side seams on the wrong side of the fabric and turn to the right side when finished. Cut the pattern pieces from the computer printout templates. Pin the pieces to the felt and cut carefully, keeping the edges smooth. Lay out all the pieces on the right side of the white cover to make sure of the proper placement. Gently lift the edges of each piece and use a pencil to mark small dots on the white cover for exact placement. Beginning with the feathers, spray glue on the wrong side of each piece and layer according to the pencil dots. Next add the body, followed by the head, face and feet. Remember the stroke of genius that led me to create Scrambled Eggs à la Quiche Lorraine? Of course, you do! You've been kicking yourself since then, wondering why you didn't think of it. OK, all of you egg-haters might not be kicking yourself about such a wonderfully simple and delicious egg dish, but I'm not here to convert you. Feel free to go on about your business. Now, for the rest of you ... remember the old Ritz cracker commercial ... well, actually two Ritz cracker commercials? Question: What are you hungry for, when you don't know what you're hungry for? Answer: Something on a Ritz cracker! Everything tastes better when it sits on a Ritz! Half the time I can't remember from one minute to the next why on earth I walked into another room, but I can remember old television commercials and jingles. It's a gift! So right after I finished the last bite of my quiche Lorraine scrambled eggs, it hit me. A second flash of inspiration! Why not put that delicious culinary creation on a Ritz cracker? Fast, delicious and ... convenient! And that Ritz cracker is like a little bit of a crust beneath my quiche-like scrambled eggs. Why not indeed! Another million dollar idea I am sharing with you -- for free! What tasty little morsels they were! Almost quiche Lorraine ... avec une croûte de Ritz! Brilliant! I'm sure someone has, but using many different search term combos, I could not find anything in Google. I'm usually a very good Googler! I am right in the middle of a love affair with leeks. I made a quiche the other day and the first bite reminded how much I love the taste of leeks ... and then there's the whole eggs + cream + nutmeg + Swiss cheese quiche thing too. But mostly I was just struck by the sublime taste of sauteed leeks, so much so, that I have added them to a number of other dishes lately. Tonight I was craving more of that mellow leek flavor, but not quite enough to take the time and trouble to bake an entire quiche for myself. After all, it was 9 p.m. -- the hour of weakness in the face of hunger long ignored. And much, much too late to begin making a pie crust. I wasn't even so sure I could trust myself alone with the whole cheesey-eggy-winey-nutmegy-leeky-baked-in-a-flaky-crust quiche anyway. Then it hit me. Maybe I didn't want to make a pie crust ... and maybe I didn't want to wait a whole hour for dinner ...but wait a minute ... how about ... a riff ... on the whole Quiche Lorraine thing? No time consuming crust. Who needs the calories! An no waiting another hour to eat! I could have my leeks and eat them too! The exact same ingredients in another form simply had to yield the same taste ... didn't they? Yes. They. Did. And in a flash to boot! The hits just keep on coming! I've already got my next million-dollar idea! Can you guess? There will be a picture! Melt butter in a large non-stick skillet. Add chopped leeks and saute until just beginning to brown. Crack eggs into a bowl and beat until well combined. Add salt, pepper, nutmeg, vermouth and finely grated Swiss cheese; stir to combine. Pour egg mixture into skillet with sauteed leeks and cook over medium low heat, stirring gently until eggs are softly cooked. Serve immediately! Note: Cooked eggs could also be served in blind-baked mini pie shells or puff pastry cups. My fascination with turkeys that fly in the face of tradition continues! The Internet is full of cute, crafty turkeys for Thanksgiving, but I was inspired by variations made with Mallomars (hard to find) or Pinwheels (easier to find.) Chocolate! The other ingredients were easy to find too -- store-bought sugar cookies, chocolate marshmallow Pinwheels and frosting from tubes or cans. If you have the need to make all the ingredients from scratch, all I can say is have fun with those Pinwheels! I had a delightful afternoon making these all by myself, but this would be a fun activity for a family or a group of (closely supervised) kids. In fact, I think I made something similar with a group of fourth or fifth-graders, back when my son was in elementary school and I was the room mother. Teachers just love moms who are eager to create a holiday activity that involves crafts and sugar, with a little chaos on the side! Wouldn't these be adorable little place card holders or favors perched on each place at the Thanksgiving table? Of course, the kids will probably want to gobble them up before they dig into all the not so cute, boring food on their plates. Let's face it, there is no jiggly jello mold, no soupy green bean casserole with yucky onions on top and no dish full of soggy bread cement that is ever going to taste like a chocolate marshmallow cookie turkey. But don't run out to the grocery store for ingredients just yet. Wait till you see what else I've made. I think I've gone just a little bit crazy. ... but after months and months of non-stop fun -- reunions, parties, visitors from afar -- I've finally got a little bit of down time before the next big event and another bunch of company arrives. Not to worry though, I'm staying busy. For instance, I've finally got some time to blog. And I've got food on my mind for Thanksgiving dinner. But since it's a little too early to start cooking, I've found other ways to prepare some turkeys for Thanksgiving. I made them myself with a "recipe" from the Disney Family Fun website (www.disneyfamilyfun.com) which I ever-so-slightly adapted for my own table. I drew my own pattern! I used a tape measure, felt, scissors, fabric glue and thread. I didn't trust the glue to hold the seams (even though the website suggested it would) so I added a sewing machine to the list and made a straight seam down each side. Now that I've worked with the fabric glue, I'm sure it would hold the "seams" under normal wear and tear. 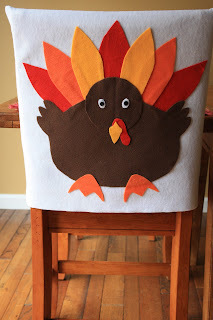 If you prefer, use iron-on fusible interfacing to assemble the turkey and attach it to the cover. The project is fast -- 3 hours, including drawing the pattern, cutting the felt, fitting the cover, sewing the seams and gluing. The project is easy -- the spray fabric glue dries quickly, so the covers are ready to use immediately. The project is fun -- especially if you set up an assembly line and get the whole family involved. I'm just crazy about these jolly turkeys! 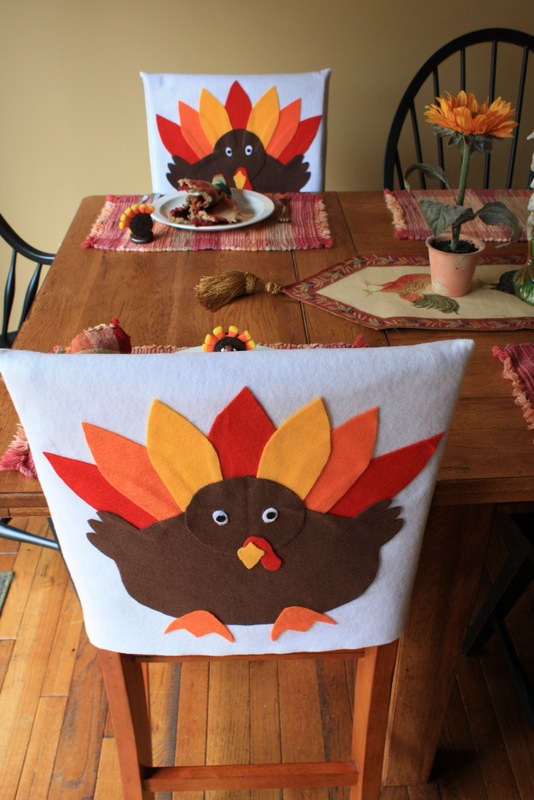 What a great idea for the kids' table, honored guests, the person who carves the turkey, the vegetarians/vegans -- or maybe everyone at the Thanksgiving table! First, decide how many chairs you want to cover and measure them for size before calculating how much white felt will be needed. Determine how far down the chair you want the cover to hang – to the arms, or to the seat, for chairs without arms. *Note - I used two square back counter chairs for my covers, but if you have Windsor chairs like my black ones in the picture, be sure to keep the opening wide enough to slide past the widest point of the chair back. Then pin the cover to fit the rounded top of the chair. Cut the pattern pieces from the computer printout templates at www.disneyfamilyfun.com or use your own drawings at the www.disneyfamilyfun.com website. Pin the pattern pieces to the felt and cut carefully, keeping the edges straight and smooth. Lay out all the pieces on the right side of the white cover to make sure of the proper placement. Gently lift the edges of each piece and use a pencil to mark small dots on the white cover for exact placement for gluing. Presto! Place the covers over the chairs to face either in or out -- your choice. Too cute! Wonder if I have time to embroider names on them too?